By the National Safety Councils Defensive Driving Course definition, defensive driving is defined as “driving to save lives, time, and money, in spite of the conditions around you and the actions of others.” It is essentially a type of training for drivers that goes beyond the mastering of the rules of the road and basic mechanics, and aims to reduce the risk of accidents by anticipating dangerous situations despite bad conditions or the negligence of others. The first defensive driving school was developed in 1964 by Chris Imhoff of the US National Safety Council and was named the Driver Improvement Program. This program included a Defensive Driving Course, along with Instructor Development Courses. Since then, many governmental organizations, private schools, and nonprofit organizations have opened specialty courses to improve public driving skills. Have you been the victim of the auto accident that was unavoidable and left you with physical injuries or property damage? At the Tapella & Eberspacher Law Firm, our auto accident attorneys fully support those who perform safe practices for motor vehicle operation and believe when these individuals are injured due to the negligent actions of another driver; the victim may be eligible to receive compensation for their losses and damages. This compensation may include; medical expenses, lost wages, property damage, pain and suffering, and funeral expenses. Find out more by calling us at (855) 522-5291 or by completing the “Free Case Evaluation” form to the right. The Federal Motor Carrier Safety Administration of the United States Department of Transportation has listed several safe practices for motor vehicle operations in order to enhance driver awareness and reduce the total number of accidents across our roadways. Unfortunately, dozens of drivers fail to follow these guidelines, resulting in thousands of accidents, injuries, and deaths each year. As responsible members of our Illinois community, our attorneys have gathered some easy to remember safe practices for motor vehicle operations. These practices will be sure to increase your awareness while driving and help prevent a safer community. Try to recognize potentially hazardous situations in advance in order to allow time to safely maneuver past them. Assume that other drivers on the roadway may make mistakes, and stay on guard for the event which an error does occur. Search ahead of what is immediately in front to be aware of approaching hazards. Typically, the driver who arrives last gives the right-of-way to the drivers who were already at a point. A driver gives the right away when entering traffic, turning left in front of approaching traffic, changing lanes, moving into your intended path or direction, and only when you are sure there will be no conflict with other traffic. When backing up your vehicle, it is critical to pay attention for pedestrians, bicycles, and other vehicles. Drivers should adjust mirrors, and assure all lights and mirrors are working properly to avoid any type of accident from occurring. It is also advised to walk around your vehicle before starting it to make sure nothing is in danger of being run over. Once everything is clear, it is safe to back-up your vehicle slowly. To prevent rollover accidents, drivers must reduce speed while negotiating a curve; this will greatly reduce your chance of rolling your vehicle. Often times, automobiles will lose traction and slide out of the curve instead of rolling over. Of course, more top heavy vehicles are more likely to roll-over is similar situations. Safe passing requires greatly developed skills and sense of judgment. This includes checking sight distance ahead, checking mirrors for traffic, checking for traffic passing you, estimating speed and position of approving vehicles, and estimating what is needed to safely pass vehicles. Due to the requirement for a driver to assess a number of different things in a short period of time, the error for accidents while passing is high. As it may take a long time before it is appropriate to pass safely, some drivers may take risks and assume other drives will compensate for their aggressive behavior. Taking left or right turns with longer vehicles presents problems that other automobile drivers do not have. There are many blind spots that make it difficult to see other vehicles, while vehicle length may require drivers to take wider turns. These wider turns also take longer to complete, thus increasing the hazard time of this operation. Drivers must recognize this hazard and allow these vehicles proper time to complete it safely. 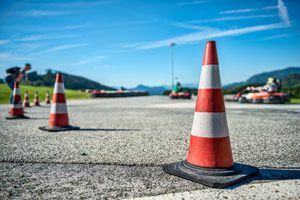 Lane changing accidents are typically caused by individuals following too closely or being inattentive to traffic conditions ahead of their vehicle. By maintaining an adequate following distance, a driver can take the appropriate measures to avoid these sorts of accidents. Drivers failing to adjust their habits in adverse conditions are a major factor of accident causation across our roadways. With such condition our visibility is greatly reduced as well as our vehicles traction. Drivers should practice developing the skills and judgment necessary to keep their own vehicle safe and under control, while also be able to anticipate other driver error in such conditions. In most cases, pedestrian accidents occur when the pedestrian walks into the roadway and into the path of an approaching vehicle. Often times, pedestrians misjudge the speed of vehicles and assume they will slow down for them. Pedestrians often think that because they can see you, you can see them. This kind of error and misjudgment is why these types of accidents occur so frequently. Thus, drivers should anticipate such errors and be prepared to compensate. Passengers can cause a large amount of driver distraction, which can restrict a driver’s ability to maneuver in order to avoid an accident. It is the driver’s responsibility to manage the passengers in order to eliminate such distractions from taking place. By following these simple steps, drivers can increase their ability to avoid becoming involved in an accident and operate their vehicle safely across our Illinois roadways. If you would like to learn more about safe practices for motor vehicle operations, our attorneys welcome you to contact our law firm with any questions regarding the law. The attorneys at Tapella & Eberspacher Law Firm have great sympathy for those injured in automobile accidents by the negligent actions of another driver. We also understand the importance of driver safety and believe that by practicing defensive driving habits, we can each do our part to reduce the amount of accidents that occur each year and create a safer and enjoyable travel experience for everyone across our roadways. Based in Charleston and O’Fallon, Illinois our attorneys are able to serve throughout the state of Illinois and Missouri. Of course, our attorneys also serve throughout the surrounding towns, cities, and suburbs. If you would like to learn more about our law firm, or would like to schedule your free no-obligation consultation, we welcome you to contact us at 855-522-5291 today. Alternatively, simply complete the “Free Case Evaluation” form located at the top of this page. It is completely free, completely confidential and we only get paid when we win.